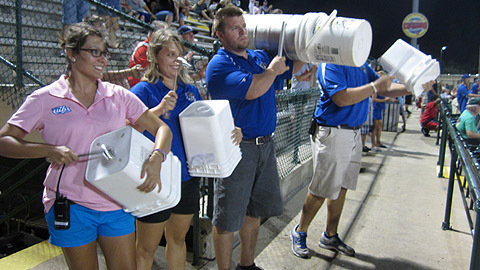 For Daytona Cubs intern deejay Derek Dye, it was nothing more than a nursery rhyme. For home plate umpire Mario Seneca, it crossed the line. A bizarre scene unfolded Wednesday night when Seneca ejected Dye for playing "Three Blind Mice" on the sound system at Daytona's Jackie Robinson Ballpark. "I thought at first when he yelled, 'You're gone,' he was talking to me," Daytona manager Brian Harper said. "That was pretty fun." Nothing was funny for Seneca. After a questionable play at first base, Harper argued the call with infield umpire Ramon Hernandez. Daytona first baseman Taylor Davis appeared to pick a ball in the dirt thrown by shortstop Tim Saunders, but it came out of his glove when he turned to toss it around the infield. Hernandez ruled Davis had bobbled the ball rather than dropping it on the transfer and declared Fort Myers' Andy Leer safe. Dye, a Cubs intern from the University of Illinois, fired up one of his new music clips -- an organ version of "Three Blind Mice," the well-known English nursery rhyme about visually impaired rodents getting into a scuffle with a farmer's wife. Seneca wheeled, pointed to Dye in the press box and shouted, "You're done!" Ditto for the Cubs' public-address announcer. "Turn the sound off for the rest of the night," Seneca could be heard yelling during the Cubs' broadcast. Dye said Seneca initially had trouble spotting him in the press area. "I thought it was me though; I knew it was my fault," he said. "I didn't think he'd get angry. I just started laughing. I was shocked. Disbelief." Daytona's PA announcer sat silently at his desk, while Dye was stunned. "I think it's a pretty popular children's fable," Dye said. "He's umpiring the game tomorrow, so I don't think I'll be playing it anytime soon." On his Facebook page, Seneca posted, "The good news is that I called my league president afterwards, and he said I did the correct thing. His opinion is pretty much the only one that matters, since he's my boss." The rules back up Seneca's interpretation, since it's stated that audio (music, organists, etc.) "may not be played in a manner that may incite spectators to react in a negative fashion to an umpires' decision." "There are rules in place, and we violated that rule in the playing of an instrumental organ version of 'Three Blind Mice,'" said Daytona general manager Brady Ballard. "As the rules were written, the objection was warranted." Robbie Aaron, the Cubs' radio broadcaster, said the play appeared questionable, adding that Harper didn't argue too strenuously. Once Dye exited the PA booth, Cubs director of group sales and merchandise Jim Jaworski climbed atop a box and began announcing players from the crowd. "The fans really rallied around the lack of PA or music," Aaron said. "Our staff got buckets to make noise and it kinda worked up the crowd on a Wednesday night." Dye, whom Aaron described as a "diehard Cubs fan," said he wasn't totally sure whether an umpire has the authority to eject members of the gameday staff. "I haven't seen the flow chart on umpire jurisdiction," he said, "but I guess it's his call. Once you eject a guy, I can't walk down there and plead my case." Dye said it was the first time he'd played the song, although he's heard of umpires being irked by expletives in songs. He noted the version of "Three Blind Mice" he played was an instrumental. "This was the first day we had organ music. ... It was the first time we played the song," Dye said. "[Seneca] said he'd bobbled the ball at first, they called him safe and I played 'Three Blind Mice.' Within 10 seconds, I was ejected from the game." "It's something we hear in the ballpark all the time, just usually as a joke," Aaron added. "If there's a close call, we play the 'Reeeally?' clip from Ace Ventura." It was not the first time the song led to an ejection at a Florida State League game. According to The New York Times, then-Clearwater Phillies organist Wilbur Snapp was tossed for playing "Three Blind Mice" during a game in 1985. Seneca, 29, umpired last season in the Class A Midwest League. Daytona held on for a 2-1 win as Jeffrey Lorick struck out Michael Gonzales and Kyle Knudson to leave the bases loaded in the ninth inning. "The fans really got into it," Dye said.